I guess he would have to be the guy in the back row with the green shirt, glasses and fro. Yup Joey has jury duty today. He had to leave way early this morning to be in Corona( yea they sent him all the way to Corona) for jury duty. He has called a few times today and he seems like he pretty interested in the whole process, but he can't believe that he is still on the panel. He thought for sure they would have sent him packing when they saw the faux-hawk. They have eliminated some people already for economic hardship, but lucky Joey works for a company that believes in civic duty and pays their employees while serving jury duty. I think he is secretly hoping to be picked for the final jury. I have never (knock on wood) ever been called for jury duty. I have a car and I am registered to vote, and in the last 10 years of eligability I have never been called. I once got a letter from a friend (infact I got it the night Sophia was born) who was just catching up on correspondences during all the waiting at jury duty. 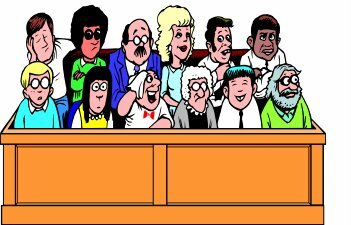 Anybody have a good jury duty story?? In the future he can request to be transferred to a closer courthouse...if there is one. Invisible Idaho girl is jealous! I always wanted to serve but never got picked. What's the case about? man i am only 20 and have been called 3 times. i actually have to go in for the first time though. its coming up this month sometime. i better check that out! Roman just got called to jury duty for the first time, but the doctor is going to write a letter to permanently excuse him. LUCKY!!! I did serve on a jury once, but the case was so lame! It was when I lived in the Bay Area and this chick had been picked up on the side of the road in a stranded car, she was drunk and they found drug paraphanelia on her. She had a history of drug abuse. The charges were drunk driving, posession of drug stuff and it was sooo lame. We deliberated for a day and a half and could not come to a unanymous decision, so the charges were dropped. I did enjoy the process and learned a lot about our legal system>Is Joey on a good case? ?